In downtown Los Angeles, you learn not to look at people. Part of it is because LA is extraordinarily impersonal. But a lot of it is because you could potentially make yourself a target. LA natives know well that some strangers you encounter can be unpleasant at best and dangerous at worst. I have a family friend who accidentally made eye contact with gangsters; they apparently didn’t like the way he looked at them, and slashed his tires. At that moment, I had never felt more pathetic about myself. It could be that if I had made eye contact with him, he might have chased after me in a frenzy or begged me for drug money. But it also could be that if I made eye contact with him — and merely nodded in acknowledgment — I could have reaffirmed that he is a person, that he does have worth, and that someone out there does care for him. A lot of us — myself included — tend to ignore homeless people, sometimes out of convenience, a lot of times out of fear. Having their existence ignored probably does a lot to reduce the poor’s self-worth. However, we don’t have to give money or even spend a lot of time with the poor to help them regain their sense of human dignity. If we only look at them and nod and maybe say “hello” when we pass them by, we acknowledge their existence, and therefore reaffirm that they are indeed human beings, just like us. It is in small, random occasions like these that we can establish a connection in which we are equals. Our world can be harsh, and it can lead us to harden our hearts out of necessity. But we as Catholics and Christians should remember that our mission is not to harden our hearts, but to open them. It doesn’t have to take any extraordinary effort. A simple look and a nod can make someone — especially someone who feels unloved and uncared for — feel like a person again. I don’t know what happened to that homeless man I ran into last week. For now, I can only pray for him. And I can hope that someone, more courageous and with a better head and heart than I, ran into him, looked at him, and gave him a smile — from human to human. Now this isn’t your typical Christmas movie. (At least, insofar as the “typical” Christmas movie takes you into the lives of the homeless in Japan.) Three Tokyo “bums” — Gin, a middle-aged alcoholic; Hana, a born-again Christian and a former drag queen; and Miyuki, a teenage runaway — find an abandoned baby on Christmas Eve and set out to find the baby’s parents. As they witness kidnappings, double-crossings, and attempted suicides, each of the protagonists’ histories is revealed. There is a realistic roughness to each one of the protagonists; it seems as if there is always something for which we can condemn them. Indeed, the film soon makes clear that no one is blameless (except perhaps the abandoned baby). Yet Gin, Hana, and Miyuki each have their moment to redeem themselves, and it is at these moments that they become most beloved to the audience. Three essential themes emerge to the discriminating Catholic viewer. First, each one of us is a person with a story; no one can ever be considered “trash” or less than human. Even though the protagonists are homeless and “useless” to society, they all have a back-story to why they are in their current state of life. Second, everyone has a family, and family is essential to who we are. Though Gin, Hana, Miyuki abandoned their families, some seemingly supernatural force brought them back together. Moreover, the three protagonists form a sort of surrogate family of their own, and despite the fact they despise each other at times, they care deeply for each other. The bonds of family — whether biological or not — are near-impossible to sever. The third and final theme of Tokyo Godfathers is the little miracles in our lives that we call coincidences. Coincidence follows coincidence after Gin, Hana, and Miyuki discover the baby — they are led back to their families, gain flashes of insight about themselves, and even have their lives saved. Indeed, one might say that “coincidences” are proof that a higher plan is guiding us; nothing ever happens without reason. This isn’t your typical Christmas movie, but that doesn’t mean you shouldn’t watch it. Add it to your to-watch list for next Christmas season…or as early as now, for that matter. Content: Narrative that relies heavily on flashbacks. There are plenty of twists that keep you on your toes, and the flashbacks progressively humanize the protagonists throughout the film. Style: True to form, Satoshi Kon (director of the anime films Millennium Actress and Paprika) makes you scratch your head as you wonder if you’ve missed something. 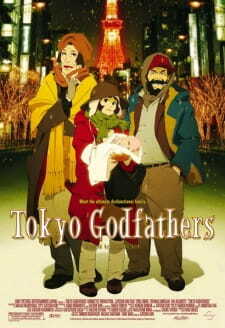 However, Tokyo Godfathers wraps up much more cleanly than Millennium Actress and Paprika. Catholic: A subtle analysis of the human condition that places emphasis on the dignity of every person and on the family. Very Catholic indeed, if not outwardly so. Does Christ live only in the hearts of the poor? So because of my horrid hour-long commute to and from downtown Los Angeles for my summer job, I’ve been able to tune into the radio news a lot more. I’ve been particularly intrigued by the debt limit talks — not just because I’m feeding my new interest in economics, but mainly because I’m fascinated by Obama’s antagonization and even demonization of the rich. Skip to 1:40 to get to what I’m talking about. The antagonization of the rich is really nothing new. With our elementary logic and imaginations, we almost automatically perceive rich people to be selfish, self-indulgent, and self-entitled and poor people to be selfless, hard-working, and virtuous. The rich prey on the poor; it’s common sense Darwinism. Take Publius Clodius Pulcher, who built his political career on inciting the impoverished masses against the wealthy aristocracy. Also take the book Radical Compassion (which I had to read for a Portland service immersion last winter), whose basic thesis was that the Catholic Church can be truly Christian only when it rejects everything else except the hearts of the poor, because that is where Christ lives. But this antagonization of the rich and idealization of the poor doesn’t work. (For one thing, if the rich are subject to certain vices, so, too, are the poor to their own. But that’s another discussion.) As Catholics, as Christians, we’re called to love. But I find that the attack on wealth is motivated not by justice, but by jealousy — and as such it inspires not justice, but jealousy. And I think it all too much betrays a lack of trust in God. It betrays a lack of trust in the truth that God can sanctify all things, including wealth. God is present not just amongst the poor. He can be present anywhere. Consider how the wealthy are able to provide jobs (and thus impart wealth) to the poor. Consider the example of rich bankers in Ancient Rome who, when the Senate House burned down in 53 B.C., saved the rest of the City from the fire by hiring on-the-spot firefighters — out of the “self-interest” of wanting to save their financial records. Consider, too, this youtube video posted by a facebook friend, which states that the wealthy are basically the “test-market” for any product before it is perfected and made available to the greater public. They didn’t intend it, but good still was produced. These are acts of self-interest, and yet they somehow benefit everybody. These are just examples of how God can sanctify wealth; these are examples of how God can live amongst the wealthy, too. And these examples don’t even take into account the instances of sincere altruism by those who have the money — scholarship founders who provide inner-city students with the opportunity of private school, for example. Lots of good can come from the wealthy — whether intended or not. God brings out the good either way. Christ can live in the hearts of the poor. But every good Catholic — every good Christian — should remember that Christ, in His infinite goodness, can live in the hearts of anyone. Rich people included.